13 Days Left! The Great Chol Hamoed Event! 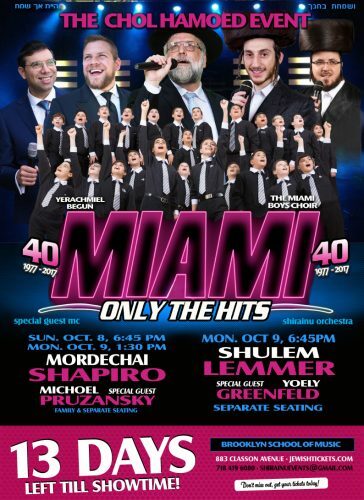 MIAMI 40 – ONLY THE HITS! The Great Chol Hamoed Event! MIAMI 40 – ONLY THE HITS! Sunday eve. Oct 8, 645pm. Separate entrances and separate levels for men and women. Coming off the North American portion of their 40th Anniversary Tour, to Toronto Chicago and Montreal, Miami’s next stop is Succos in Brookyn. 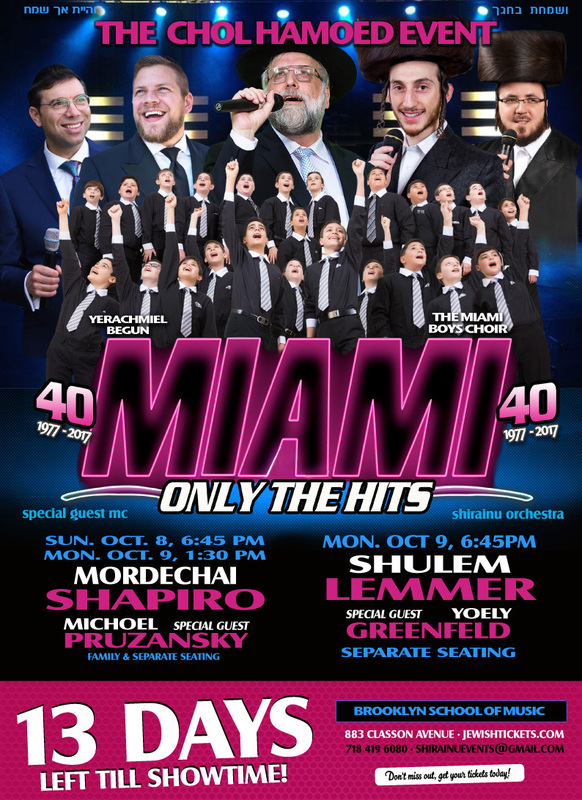 3 amazing shows of the greatest Yerachmiel Begun & The Miami Boys Choir Hits ever; performed by unreal vocalists and showstopping dances. In honor of Miami’s 40 anniversary, Shirainu is making the tickets extra affordable for all families to attend. Such prices have not been seen in 20 years. What an unbelievable opportunity not to be missed. Go to Jewishtickets.com. Mordechai Shapiro (a miami alumni!) has quickly become a household name in jewish music. His exciting original style combined with creative great vocals have made him a big in demand vocalist. Now, before Succos, he is releasing his second smash album, long awaited. Starring on the Sun. eve and Mon. aft show, he will be featuring songs from both albums and other surprises. Guest Starring on these 2 shows is Michoel Pruzansky, fresh off his new exciting album, just released this past week. Michoel brings high energy and great performance to the shows. The Mon. eve show will be a first in Jewish music annals. With the Brooklyn School of Music featuring a great orchestra section and a close in balcony, the men’s seating will be downstairs and the women’s seating upstairs; with separate entrances into the building. This Mon. Eve show will be Starring the phenomenal Shulem Lemmer. Fresh off his hit debut album, produced by Yochi Briskman, which was released in August to immediate rave reviews. He has what is considered one of the most versatile voices ever in Jewish music. A range unparalleled; yet with deep emotion. The song LEFANAV has taken off as a major dance song at weddings (composed by Yerachmiel!). Guest Starring will be the one and only Yoeli Greenfeld, considered by many as having one of the greatest voices in the Jewish Field. Both shows with music by the famed Shirainu Orchestra. Join the 5000 people who will iyh be attending THEE Chol Hamoed event! 883 Classon ave in Crown heights. 15 minutes from Boro Park and flatbush. Ggmc parking lot across the street from the air conditioned theater.